Clay soil is dirt made up of extremely fine particles. These particles pack together very tightly and have very little room between them. Because of this, clay soil has poor aeration and will not drain well. Clay feels slippery when it is wet and will dry to a rock-hard consistency. Plants that are placed into this soil cannot develop well because they have difficulty pushing through the soil substrate. Ultisol is the U.S. Department of Agriculture’s identification for silicate clay. Silicate clay is soil created through the weathering of rocks. The largest concentration of ultisol is the red clay that is found throughout the South. This soil is a result of the breakdown of rock from the major mountain ranges found throughout the region, such as the Appalachians, Ouachita and the Ozarks. Ultisols are reddish, yellowish or orange in color and are usually acidic. An example of a ultisol is the piedmont soil that extends from the mountains to the flood plain along the southern Atlantic coast. 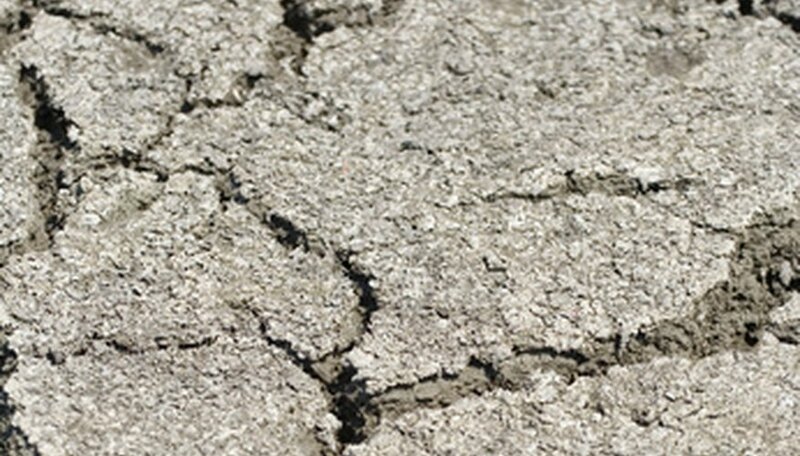 Vertisols are soils with a high content of expansive clay, which is clay that swells and shrinks in response to the presence or absence of water. According to the USDA, vertisols appear in high concentrations along the Mississippi River and in portions of Texas and the plains of the Northwest. Vertisols are black in appearance and have deep cracks that extend through them as the consequence of constant expanding and shrinking. Houston black soil is an example of a vertisol. Alfisols are soils that are a mix of clay and loam that occur naturally under hardwood forests. This type of soil occurs in the Mississippi and Ohio River drainage basins. The "Alf" of alfisols stands for aluminum, al, and iron, fe, which are two minerals found in high concentrations in the soil. Soil with the alfisol classification may be found throughout Ohio, Indiana, Kentucky and Louisiana. Although these soils contain higher amounts of clay, they contain many nutrients and are suitable for farmland. An example of an alfisol is the duval soil series of Texas.